I like recipes that are created out of craves, when the ingredients are selected out what's available or what you really want to have. That has been the case with my past few pasta recipes, and definitely the case with this one. I was looking for a more robust texture, so I chose these strozzapreti "Rustichella d' abruzzo", which you can find at Liang Court. I was craving again for these Italian fresh tomatoes which I blogged about in my previous few posts, and I wanted to make good use of my ever growing basil plants. 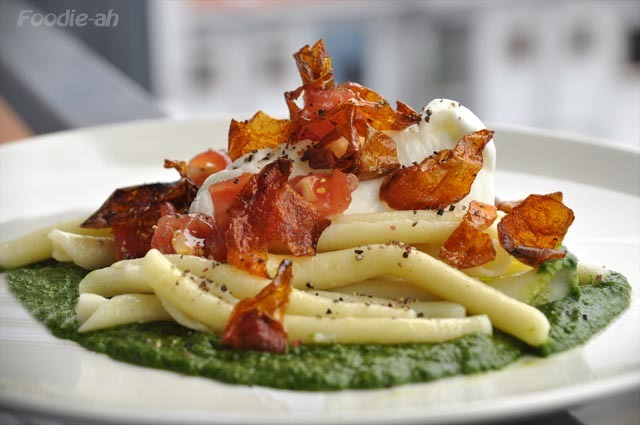 I decided to combine these classic Italian flavours into a new pasta recipe, which I called "Caprese" for obvious reasons. 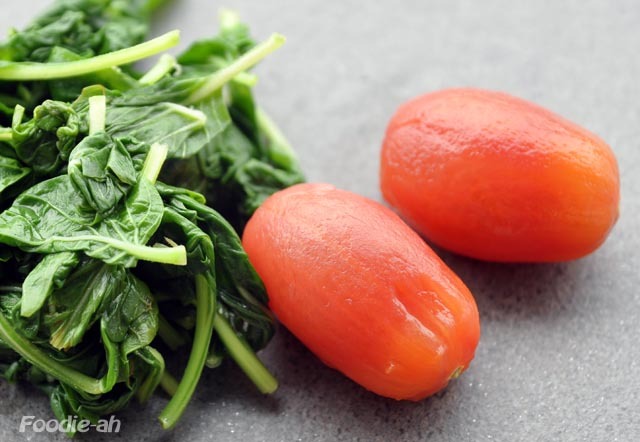 As described on my previous recipes, remove the skin from the tomatoes by making a superficial incision on them (I cut a cross at the bottom of each tomato), then blanching them in boiling water for about 20 seconds and then immediately placing them into ice water. The skin should break apart and come off easily. Reserve the skin, then deep fry it in a small skillet where you have brought hot oil to the right temperature (about 180C). 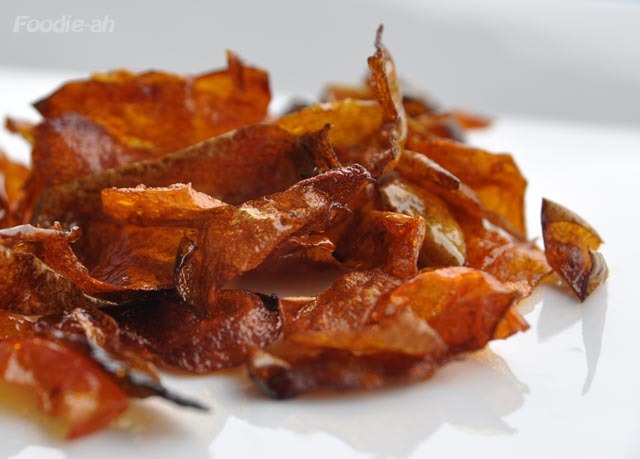 Remove the tomato skin from the oil when it starts to darken, dry out and crisp. Wrap it loosely into a couple of sheets of kitchen paper, which you then seal with your hands and shake repeatedly to let the oil be absorbed by it. Set aside. Chop the plum tomatoes into small dices (about 6-8 pieces per tomato), then sprinkle with salt and set aside. Blanch the basil in boiling water for 15 seconds, then again in ice water. drain it well, place it into a tall container with a tiny amount of finely chopped garlic, optional green peppercorns and some salt. Pout 2 tablespoons of extra virgin olive oil, then whizz with an immersion blender for a good 5 minutes, until it is reduced to a smooth cream of basil. You might need to add some olive oil to reach the right texture, but the end result should be solid and not viscous. While the pasta is boiling, heat up some extra virgin olive oil in a large 28cm frying pan, fry 3 squashed garlic cloves until golden, then remove them. Add the stock, cover immediately and remove from the heat. When the strozzapreti are almost ready (I counted 12 minutes), put the frying pan back on the fire, drain the pasta and pour it into the frying pan together with 1 tsp of salt. Saute' the strozzapreti for a couple of minutes, until the stock is absorbed and you are left with a few tablespoons of sauce at the bottom of the pan. 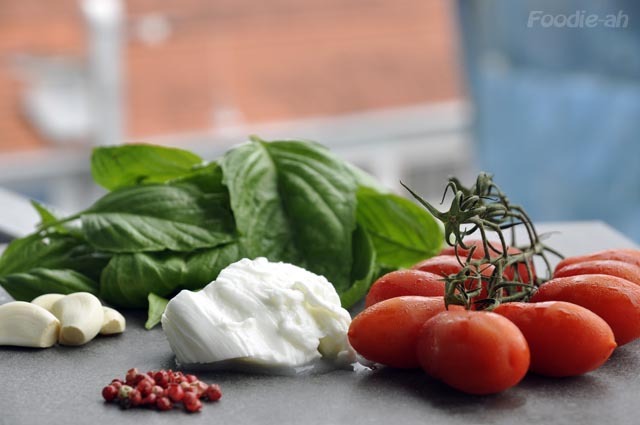 Finally, arrange the basil cream circularly at the bottom of a warm plate, place the strozzapreti in the centre, then top with a chuck of buffalo mozzarella, the diced fresh tomatoes and the tomato skins. Pour a tablespoon of the sauce left in the pan onto each serving, then sprinkle with the crushed pink peppercorns and serve hot. Simple Venetian food, it's not cheap, but then again nothing is in Venice. I can guarantee that if you just walk into any place in Venice, 99% chances you are in for a ripoff and bad food. It is famous for that. In Rome it will be almost as hard, besides the street food that can be quite good. I HIGHLY recommend you to go to the Jewish quarter and eat there. Just pick any restaurant on the main street of the jewish quarter. Don't be mislead, their food is actually Italian/Roman. Absolutely fantastic. Try their amatriciana and deep fried zucchini flowers! Also, try the buffalo mozzarella there, preferably at lunch time.